One of the top 10 beaches in the world, with amazing walks and breathtaking scenery; you name it, Tasmania has it. More specifically, the Freycinet Peninsula has it, and more. Spending a weekend here may not be enough, but we are sure going to try to fit everything in that we can, because this place is truly out of this world. Wineries, beaches, walks and beautiful accommodation, the Freycinet National Park and Coles Bay aim to please, and leaves you with a sense you have experienced a place that is unlike any other. The Bay Restaurant at the Freycinet Lodge is your ideal spot, after a full day exploring, to relax and enjoy elegant surroundings, magnificent views and delicious cuisine. They have a seasonal menu that aims to showcase the finest produce from the region and some of the best seafood in Tasmania. The Palate Restaurant is all about taking the very best from the land and working with it, hence their daily changing degustation menu and a la carte menu. Multi-course degustation menus are matched with outstanding local wines, all of which is enjoyed overlooking the panoramic views, perfect for a romantic getaway. With friendly and relaxed service, you may never want to leave. At Devil’s Corner you are spoiled for choice for where you want to eat while you are enjoying their wines, and overlooking the The Hazards Vineyard. Diners can choose from either Tombolo Pizza Cafe, serving pizza in all its glory, perfect if you are feeling like carb-alicious treats; or perhaps you are craving something from the sea, so head down to The Fishers, dishing up oysters, fish and much more yummy goodness. Milton Vineyards focus is producing small quantities of handmade wine, lending off the land to create the best quality wine, specifically as the vineyard has a unique micro-climate that suits the ancient grape Pinot Noir. Other aromatics grown are Pinot Gris, Riesling, and Gewurztraminer, which are grown on free draining red loam and liberally sprinkled with dolerite rocks. To start with, the Geographe Restaurant has a million-dollar outlook, and is worth a visit just for that, but when your coffee (and maybe a snack) arrives, you know you’ve hit the jackpot. We can’t ask for more than good service, great food and a stunning lookout, and Geographe Restaurant has it all. Geographe Restaurant was named after the French Corvette, Le Ge`ographe, which led an expedition to Australia in 1800. The restaurant serves breakfast, lunch and dinner. Spring Vale Vineyard and Cellar Door began in 1986 and started by building off the warm days and cool nights of the Freycinet Coasts, which is a climate ideal for slow ripening and excellent flavour development. Spring Vale Vineyards’ small and intimate cellar door is actually an old stable, which was built by convict labour in 1842 and is now heritage listed. Whether you visit for the incredibly picturesque cellar door, the history, or of course, the wine, it will be well worth your time. Explore Freycinet’s natural beauty on the water in guided sea kayak tours. 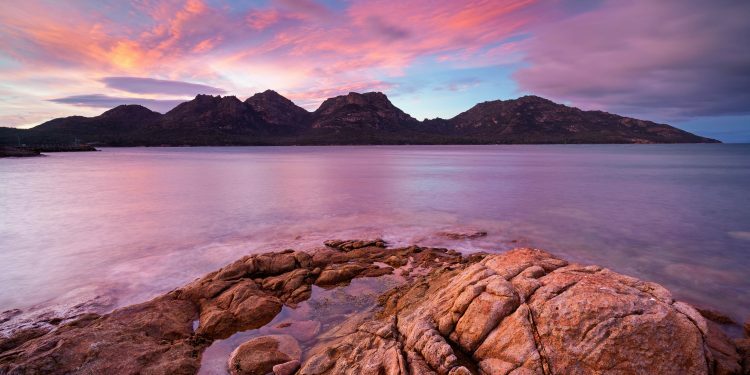 Experience the beautiful Freycinet Coast from a different perspective, getting exclusive views of the Pink Granite mountains, turquoise water and sandy beaches. The tours depart from the town of Coles Bay which sits at the foot of the Hazard Mountain Range. All gear and equipment is provided and the tours are beginner friendly. You can see the sights from the water and from the ground, why not the air? See the Freycinet Peninsula and Wineglass Bay in a fixed-wing plane or helicopter, first flying over the stunning Moulting Lagoon and Friendly Beaches. Then the route will take you down the coast by the Hazards and Wineglass Bay, before returning via the untouched beaches on the west coast of the peninsula. Walking through the Freycinet Peninsula is a must-do – if not for the view, for the beaches. Our advice is to go in the summer, because you do not want to miss out on this water! The Freycinet National Park is home to one of the top 10 beaches in the world, Wineglass Bay. 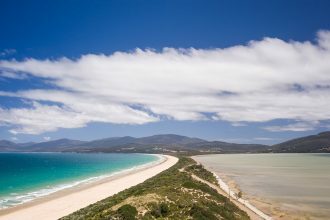 There are a number of walks, such as Wineglass Bay Lookout Walk, Hazards Beach and Cape Tourville. They can vary and be fairly steep, but the reward is the natural beauty of the land and the cool respite of the crystal clear water. Eagle Peaks offer stunning views of the Great Oyster Bay and the Peninsula from the Ocean View Studios, and views of the Freycinet Peninsula, Hazards Mountain Range, Great Oyster Bay, Schouten Island and Maria Island to the south can be seen from the Upper Residence. The apartments are open plan, are stocked with continental breakfast in a fully equipped kitchen and two bedrooms with a king sized bed and a queen bed. The Freycinet Lodge is located inside the Freycinet National Park, just outside of Coles Bay, overlooking the blue water of Great Oyster Bay and the rugged mountains of the Hazards. With spa views to-die-for, superb dining options and the option of the coastal pavilions (pictured right), you will find yourself in a slice of Tasmanian heaven. Freycinet accommodation that is both idyllic and contemporary, with wall-to-wall views of Great Oyster Bay. Unwind on the private deck where you can watch the sunset on the pink granite Hazards Mountains. The rooms represent eco-tourism, while The Edge Restaurant is only metres away from the suites. The rooms were designed with total privacy and maximum relaxation – so what are you waiting for?